Beat This Caption Contest 136 Winner – Caption Contest Funny Clever Witty Enter Today! Hey, that’s the Babysitter’s Job! 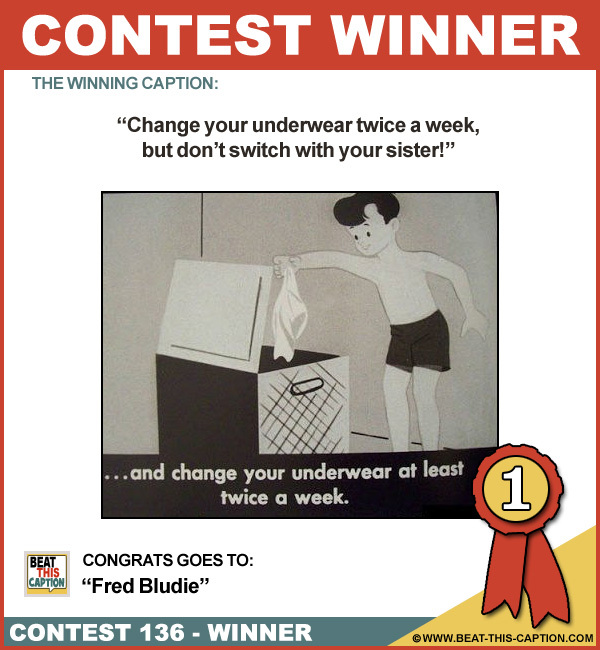 Change your underwear twice a week, but don’t switch with your sister! Great Caption! NOW you tell me! ;) You WIN! This must be the accident that Mom warned me about! That’s the last time I use my little brother’s hanky to sneeze in! Good luck getting out THESE skid marks! Now I know why they’re called Fruit of the Looms, it smells like there’s a rotten banana in here!